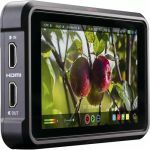 The Lilliput FS7 7" 4K HDMI/3G-SDI Monitor is a high-contrast on-camera monitor with a native 1920 x 1200, 8-bit resolution display. The Lilliput FS7 7" 4K HDMI/3G-SDI Monitor is a high-contrast on-camera monitor with a native 1920 x 1200, 8-bit resolution display. View clear, sharp images up to DCI 4K 4096 x 2160 via HDMI, and up to 1080p60 via the 3G-SDI input. The FS7 features a 1000:1 contrast ratio, 500 cd/m² brightness, and a wide 170° viewing angle. Both the HDMI and 3G-SDI signals can be looped out to other devices. Two user-definable buttons may be used to create shortcuts to your favorite monitor functions. Display functions include false color, level meter, freeze, DSLR, exposure, and image flip modes. Mount the monitor to your camera rig using the included ball head shoe mount adapter. The Lilliput FS7 accepts a wide range of 7 to 24 VDC power, and includes a Sony L-series type battery plate. Housed in a durable metal body, the FS7 also comes with a folding sunshade, an HDMI cable, and an AC adapter.